80’s South African Pro Wrestling Legend Danie Voges boots back in action! In tribute to 80’s Pro Wrestling Legend Danie Voges. Danie Voges is the uncle of Kobus Erasmus aka Ananzi. 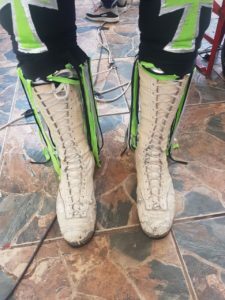 In tribute to his legendary uncle Ananzi took his uncles boots from the 80’s cleaned it and wrestled in it at the Impala Rally. A nice way to show his love and respect for his uncle the Legend Danie Voges.